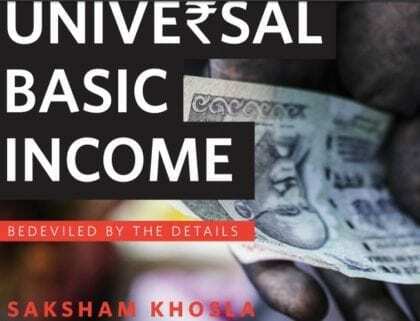 Saksham Khosla, a research analyst at Carnegie India, has written a detailed report on the implementation of basic income in India. His research focuses on the political economy of administrative, economic and welfare reforms in India. Less than a year ago, India’s Finance Minister, Arun Jaitley, presented the Indian government’s Economic Survey, which featured a 40-page chapter on basic income and its implementation in India. Khosla report now comes and offers path onward, recognizing the previous survey achievements and limitations. Briefly reviewing the Economic Survey and its features, he writes that “the survey’s central design features offer a weak foundation”, and that if not subject to a deeper analysis and debate it “will produce underwhelming results”. The new report calls for a basic income trial in India (or several trials, as presently the case in the Netherlands). The rationale behind this assertion is that hard evidence is crucially needed, so the discussion can move “from academic conferences and opinion pages into parliamentary debate and legislation.” However, it warns about the relevance of such trials, arguing that none can be achieved without strong public support and clear economic fundamentals. It also notices that cutting through all existent social programs, although most being inefficient and expensive to administer, could “turn quickly from manna from heaven to actively undermining the Indian social contract”. Finally, Khosla report also acknowledges the importance of developing and enhancing the recently deployed Aadhaar authentication system, plus other initiatives to boost digital payments and further financial inclusion, which, apart from the political and tax collection problems still to resolve, are key to a future basic income implementation in India. The Basic Income, our Agent of Transformation, should be given in increments or installments which will ensure that no one ever goes broke, and also help “those people who can’t manage money well” to learn. And The Basic Income should “melt” so that each installment vanishes just before the next one arrives. All money should in fact melt. It is the only way to possibly manage Demand = Supply, and the stable Price. There are two kinds of money. One is hoardable , the other which is hardly ever talked about is un-hoardable . When we begin using ice-money which melts, we will be able to move through capitalism, to the promised Land. Oh yeah, the Land is God’s gift to the children. It should not be bought and sold and hoarded like a commodity. The basic income should be a separate money from the usual issue . It should be US basic income dollars with Demurrage issued by the US government national currency office . It should not circulate outside of the United States. Money which is hoardable is impossible to manage. .